London/Oslo 9 February 2016 – News that Norwegian journalist Silje Kampesæter has been denied a renewal of her work permit and press accreditation in Turkey without any explanation is a further worrying sign of the clampdown on freedom of expression in the country, PEN International and Norwegian PEN said today. ‘It’s hard to fathom why such a respected journalist should be considered persona non grata in Turkey. This raises questions about what the authorities may be trying to hide from the outside world, particularly in Diyarbakir/Amed and other parts of the south east where disturbing reports about the escalating conflict,’ said Carles Torner, Executive Director of PEN International. 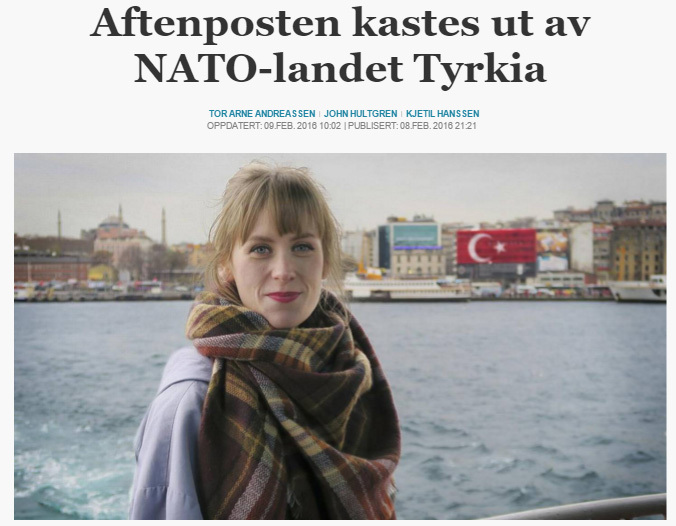 Kampesæter, who works for Norwegian newspaper Aftenposten, opened a bureau for the paper in Istanbul in September 2015 and has shed light on Turkish domestic politics as well as reporting from the south-east of the country on the escalating tension between the authorities and the Kurdish armed group, the Kurdistan Workers Party (PKK) which has resulted in attacks from both sides. ´By such actions, we see how the Turkish authorities step by step are distancing themselves from the principles of human rights and freedom of expression. These are issues which the international community must urgently address in its efforts for cooperation and political stability in the region,´ said William Nygaard, President of Norwegian PEN. PEN International has long campaigned for greater respect for freedom of expression in Turkey. In December 2015, PEN International and PEN Norway launched a joint report Surveillance Secrecy and Self Censorship: New Digital Freedom Challenges in Turkey on the declining space for freedom of expression online. Journalist Can Dündar, a member of PEN Turkey, was arrested just before he had completed a preface to the report and is currently in prison, alongside his colleague Erdem Gül, awaiting trial on national security charges including espionage for which they are facing possible life sentences.